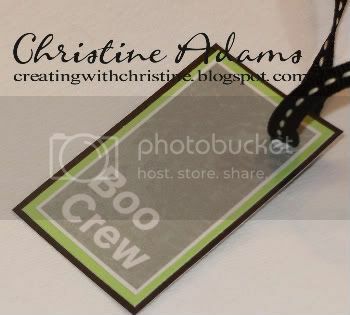 Creating with Christine: Hooligans Kit - Maxed Out!! I've been using our fabulous workhop on the go kits for my clubs for almost a year now. I LOVE them for many reasons - first of all, the kit is discounted at only $29.95 every month, and also it appeals to scrapbookers, cardmakers, even general papercrafters alike! This time around, I'm out to maximize each kit - create the featured projects, but then use all the rest of my left overs to create different projects. Here is what I have come up with for the Hooligans kit. You can see the featured projects that I made here. Then with my leftovers, I created a little treat box for each of my club members! This would be great for school buddys or neighborhood kids! (I got this adorable idea from Vicki Wizniuk.) I put a little Whitman's Marshmallow candy that looks like a giant candy corn. You can put whatever treat you want in your box! 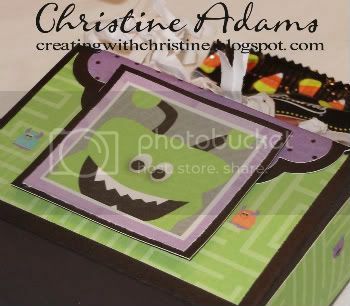 I used the pac-man looking pear colored paper for the box and the gypsy colored polka-dot paper for the front top. I had to add extra black cardstock and black ribbon from the black ribbon rounds collection. Then I used the paper that has boxes all over it with montster faces, eyes, and sayings. I cut out individual monster boxes, matted them, then attached them with 3-D foam tape to the front. Then I cut out the different sayings, matted them and made tags for each bag. The purple piece on the front of the box is just a scalloped circle cut in half then scored at 1/2" from the center and folded over the top of the box. 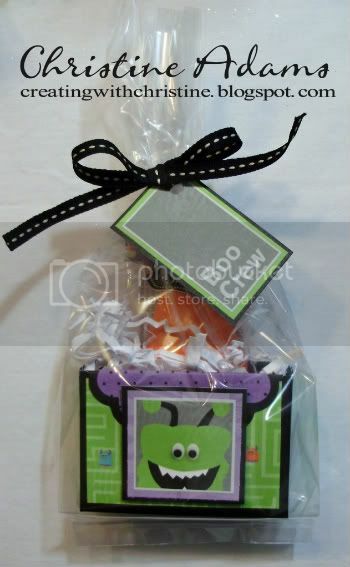 The goodie boxes themselves are simply black cardstock 5 1/4" x 6". Score at 1" on both sides of the long sides, then score at 2 1/4" on both sides of the shorter sides. So you end up with a box that is 3 1/4" wide, 2 1/4" tall and 1 1/2" deep. 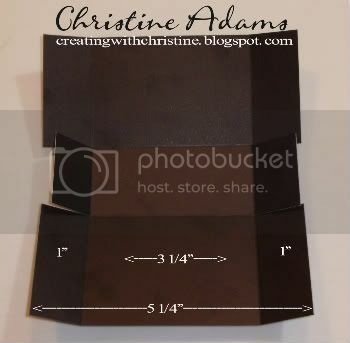 Fold in on all the scored lines, snip the 1" x 1 1/2" squares so they fold up inside allowing the box sides to overlap and close. Then cover with your pattern paper and embellish as desired! You really could have a lot of fun adding googly eyes, our new Liquorice Opaques, Liquid Glass, Prisma Glitter, our new Blue & Green Sparkles, etc. Now I'm off to make some birthday cards with my remaining leftovers -- I'll post those soon!